Ram Studios was established in 1990 and have been serving the Four Corner Area ever since. 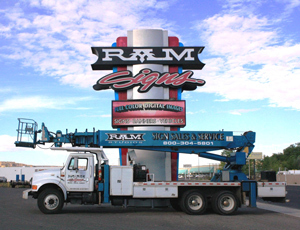 We are family owned and operated, specializing in the design, fabrication, installation of all types of signage. Our facilities include a complete metal-working, plastic fabrication and U/L approved spray booth for high quality paint finishes. In addition, we have a CNC router with a 5′ X 10′ table to provide computer cut plastic, aluminum, hi-density foam and a variety of substances for letters, graphics & logos. Our design department is equipped with state-of-the-art software programs to provide design services or work with existing computer files. RAM Studios also has an in house neon plant with a full time tube bender. We have extensive experience with electronic message center, LED and light bulb, as well as LED illumination in channel letters and border applications. Our service area includes the entire state of New Mexico and southern Colorado. We are a licensed New Mexico contractor, bonded & insured.